On the Beach - Visit some of Vancouver’s top beaches! Get on the beach! When it's hot outside in Vancouver everyone scrambles to the beach! One of the most natural wonders that makes the city of Vancouver the most livable city in the world is the public access to the waterfront. Observe the beautiful landscape while walking, cycling, swimming or playing in the sand. The beaches are one of the most popular attractions to locals, visitors and newbies that have just relocated to this fantastic thriving city! 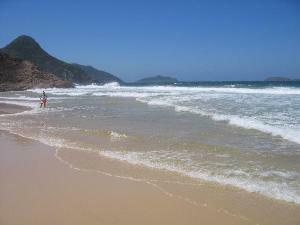 Englsh Bay is downtown's most popular beach and is attractive to all ages. It is a tourist-local haven of all kinds. You'll find sun worshippers, European tourists and celebrities. You can also get some take out lunch from Denman Street and have a picnic! This beach is lively and you can always find people hanging about. 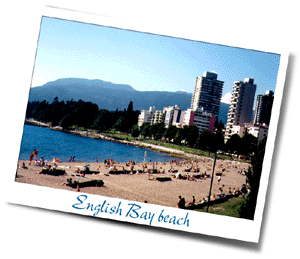 English Bay has an energized community and is located in the West End portion of Vancouver's downtown core. The two main streets that run through this area are Davie Street and Denman Street. Both of these streets are lively, vibrant and jam-packed with people. When visiting English Bay you may find yourself sipping a cafe late at a nearby quaint cafe or strolling along one of its cute, tree-filled streets taking in the smell of the pacific ocean. Kitsilano Beach is jam-packed with action! You can sit on the beach and people watch, get a bronze tan or play some volleyball. This is the place to relax and get your groove on at the same time. Kits beach is definitely a happening place that is geared for the teens to the thirties. This view is fabulous with a lovely outlook ranging from open bay, to North Shore mountains to the ever so beautiful Stanley Park. There are tons of fun activities at this beach with something for everyone. 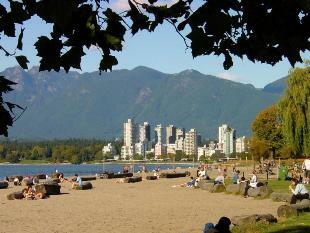 Kitsilano Beach is definately one of the most popular beaches in Vancouver, especially on a hot summer day!. 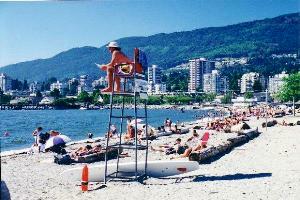 Located at the north edge of the Kitsilano neighbourhood, the beach faces out onto Burrard Inlet. Kits beach has the longest salt-water swimming pool in Canada, which is operated by the Vancouver Park Board and open during the summer days. GET OUT AND PLAY SOME VOLLEYBALL ON THE BEACH OR GET YOUR ROLLERBLADES ON AND HIT THE SEAWALL FOR A WHIRL! Wreck Beach is not only a sun worshippers heaven, but also is home to one of the most unique gathering of people that make Vancouver even more lively. One must know, it is Vancouver's only clothing optional beach and you might find people selling a variety of cold refreshments in nothing more than a string pouch. Wreck Beach is one of the largest officially clothing optional beaches in the world and it is part of Pacific Spirit Regional Park. The clothing optional section is clearly marked with signs and stretches approximately 6.5 km from Acadia Beach in the north, down to the Booming Grounds Creek on the north arm of the Fraser River. Check out this Vancouver Beach map below for beach locations in Vancouver and enjoy the sun, ocean and picnics! The locations are easy to navigate and are shown in green. Copyright 2006-2010 www.eye-on-vancouver.com All Rights Reserved.